As it's name implies, a permanent pole dancing pole is one which is permanently attached to both the floor and ceiling. Just to clarify, a dance pole that is attached to the ceiling by way of a mount that is screwed into the ceiling separately, is considered a removable dance pole . . . unless of course it's also screwed into the floor, which definitely makes it permanent! Confused yet? Hopefully you won't be after you read up on this particular type of pole dancing pole. 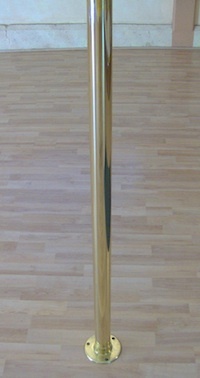 Permanent dance poles are most commonly found in studios, and in clubs where pole dancing is performed. The main reason for this choice is that, since there is normally no need to move the pole(s), there's also no point in dealing with the risks of installing a removable or friction mount model. Since a permanent pole is the safest, especially in a situation when many different people may be using the equipment, this application makes good sense. Many women also choose a permanent model for their home, usually because they don't plan to move it once installed, they don't want to have to take it down and put it back up, and/or they want the safest possible setup. If you only have one possible spot for your dance pole, and/or don't want the bother of putting it up and taking it down frequently, then a permanent pole may be the right choice for you. However, unless you are very concerned about safety, a removable dance pole may also be a good choice for you, and one that gives you a bit more flexibility. On the other hand, if safety is your primary concern, and you have the space to devote specifically to it, then a permanently affixed model is likely your best option. Permanent pole dancing poles have their pros and cons, just like any other model. I hope this information will help you decide if going with a permanent installation is right for you. Obviously, safety is a huge reason many people purchase this type of pole. These are by far the safest type available because they are permanently attached to both the floor and ceiling. Convenience is another benefit of this setup. If you prefer not to have to put your pole up and take it down, a permanent installation is ideal for you. You install it once and that's it. Aside from regular inspections of the screws and/or rivets, there's not much to worry about. However, the fact that the pole can't easily be removed once it's installed will be a disadvantage if you need to use your space for other activities, or if it's not convenient to have a vertical fixture in the middle of the room for any reason. Another downside for some people is the actual installation process. If your brain shuts down when you hear the buzz of power tools at work, or if you don't know what a ceiling joist is, installing a permanent pole may seem beyond your capabilities. This certainly described me when I had to install my first one! But don't worry, you'll likely find that a friend is eager to help you out, if for no other reason than bragging rights ("yep, I just helped Jane install her new dance pole!"). If you've decided that a permanent pole is your best option, be sure to read this page on safety for permanent dancing poles. Thinking of buying a permanent pole dancing pole? Be sure to check out this dance pole review page for detailed information on all the different brands available.